The Australian Museum is considered one of the finest natural history museums in the world with it's unique combination of exhibitions, research and impressive collections. It is an encyclopaedic warehouse of cultural and natural history. The collections at the museum cover invertebrate and vertebrate zoology, mineralogy and palaeontology, and anthropology. 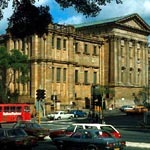 Visit the Australian Museum web site.